SCVHistory.com FF6901 | Tataviam Culture | Siblings Ernestine & Augustus Romero, Sun Valley ~1969. 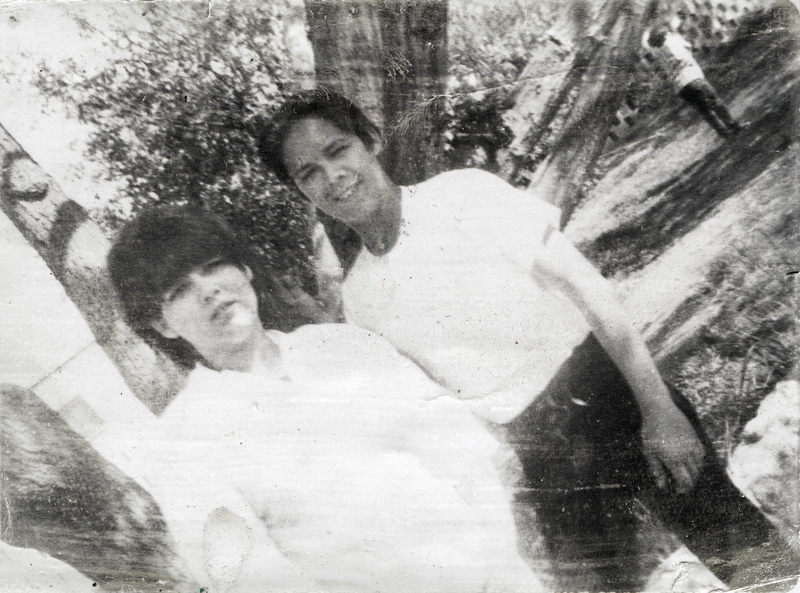 Siblings Ernestine Louise Romero (later Casarez) (Oct. 23, 1949 - Dec. 4, 2009) and Augustus Louis Romero (Dec. 14, 1952 - Nov. 20, 2008) in Sun Valley, circa 1969. Their brother John James Romero (b. 1959) is seen in the background at upper right. Ernestine, Augustus and John are children of Mary Louise Garcia (1928-1999) and Harold E. "Sonny" Romero. Mary Louise Garcia (Romero) and her descendants have ancestors who lived in the Santa Clarita Valley prior to European contact in 1769. FF6901: 9600 dpi jpeg from smaller jpeg courtesy of Geraldine Romero Perez.